If you want to advance your skills in pottery, either wheel-thrown or hand built, you will want this class. This workshop focuses on fundamental clay forming techniques and the wildly creative and expressive potential of the utilitarian ceramic form. 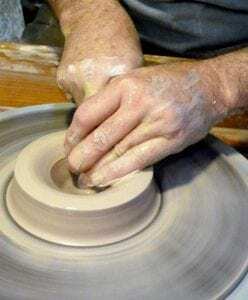 There will be demonstrations and instruction of hand building, such as pinch pots, coil pots, and slab construction; as well as wheel-throwing techniques for creating bowls, cylinders, and altered wheel forms. The finishing processes of trimming and adding spouts, handles and lids will also be covered. Instructor David Dahlstedt provides individual coaching, directed toward the student’s skill level. The class is appropriate for beginners, intermediate and advanced. Weekly classes allow student to pursue and advance in their specific interests. This class also includes studio pass access to the pottery class room while the clas is ongoing. This allows students to pursue additional projects. David Dahlstedt is the Arkansas Craft School’s potter-in-residence, bringing his wealth of experience to the ACS. Potters David and Becki Dahlstedt came to Mountain View via separate paths which converged in 1984 at the Ozark Folk Center where David had been the potter for 6 years. Together they continued to demonstrate pottery at the Folk Center for 12 years before establishing a studio in Mountain View. Combining their talents, skills, and interests, the Dahlstedts have established a full time pottery business, producing an extensive line of functional pottery, as well as one-of-a-kind pieces. David makes both functional and decorative pots. An elaborate teapot can make an artistic statement and still be used to steep and pour tea. David’s work has been included in many regional shows and is sold in galleries throughout the state. Becki makes pots as well but spends most of her time glazing the couple’s work using multiple glaze application techniques to achieve their trademark blended earth tones. David is the potter-in-residence at the Arkansas Craft School and teaches spring and fall classes at the school’s studio located in downtown Mountain View.